Aside: All recipes on this blog are gluten, soy, corn, and dairy free (aside from some magical butter, but I will always provide easy substitutions). So munch on, friends, without fear of tummy aches or other unpleasant side effects. Hello friends! I hope you’ve all been having a wonderful week thus far. At this point we’re all likely halfway through our workweek and starting to get excited for the upcoming weekend. I know I have some thrilling dates with an IBS case study in my near future… what about you? Anyhow, as some of you may know I’ve been having the hugest cravings for quinoa lately, which is strange because 1. I don’t typically eat quinoa and 2. I don’t generally eat any grains or legumes, as they do not tend to agree with me digestibility wise. Luckily for me, quinoa is not technically a cereal grain or a legume, but the seed of a type of goosefoot plant that is related to beets and spinach (and tumbleweeds, but I don’t often make a habit of eating a tumbleweed salad). As far as grain-like starchy foods go, nutritionally I don’t think it is going to cause any sort of digestive issues for many people and the literature says it is a complete source of protein. Personally, I get enough protein from animals and animal products, so this isn’t a huge concern for me, but if you follow a vegetarian or vegan diet then quinoa can supply some of the amino acids, especially lysine, which may be missing from your bean and grain sources of protein. It contains some fibre to help balance blood sugar and it’s not typically over-refined or processed, so in light of what I could dig up on quinoa I decided to run with my odd craving and make up a yummy dish out of this pseudo-grain. This is the one I’ve been running with this week (in fact I’m eating it right meow out of a jar). It includes tips for cooking quinoa, making a simple veggie and quinoa stir-fry, and recipe for a lemon poppy seed dressing that I’ve been slathering on it. However, once you’ve got the basics down, it can be flavoured any way you like. So munch on! Our basic ingredients for making some quinoa. 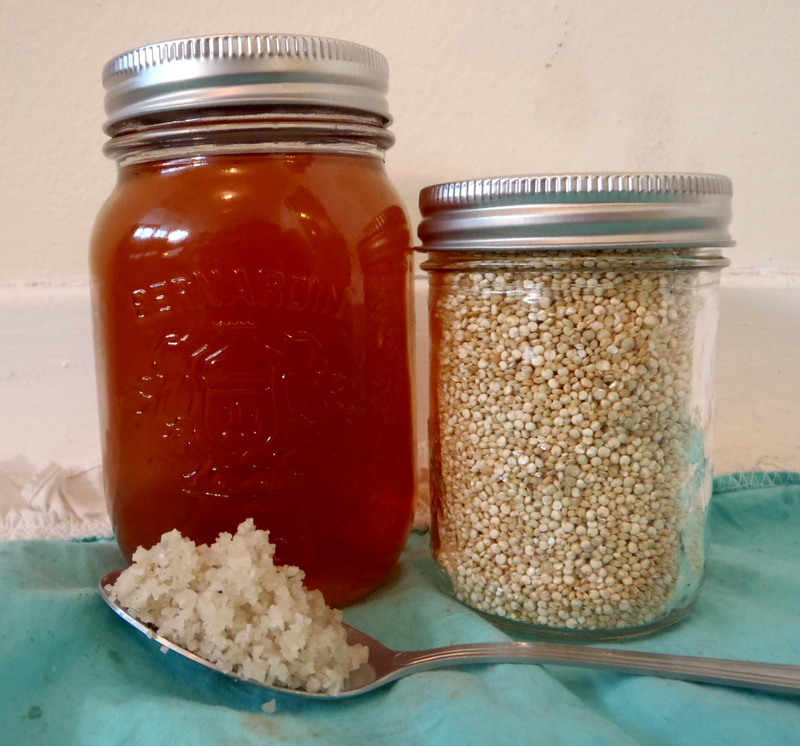 Typically quinoa is cooked in a 2:1 ratio of liquid to seed. I like to use my homemade broth but you can use water or veggie stock. I usually add about a tsp. of sea salt and a splash of apple cider vinegar just to give it a little extra kick. Bring quinoa and liquid to a boil, covered. Once liquid has been absorbed remove cover and fluff with a fork. You can then replace the cover and let it sit for another five minutes. I usually just let it sit until I’m ready to add it to my stir-fry. 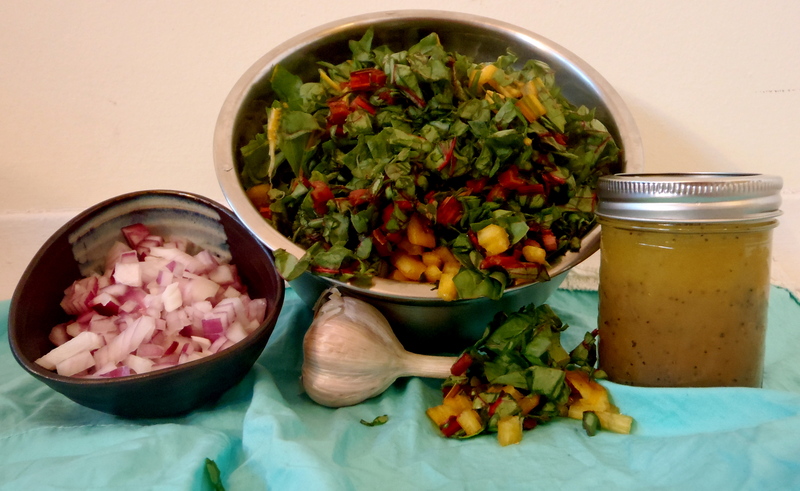 Our basic stir-fry ingredients, plus a delicious lemon poppy seed dressing! The below is just a basic stir-fry. Feel free to get creative and add things like shredded carrots or beets, red peppers, cauliflower, or whatever your favourite veggies are! A good rule of thumb if adding other veggies is: The closer to the ground they grow the longer they need to cook, so add them first. This rule means that veggies like carrots or beets which grow in the ground will take longer to cook than say, red peppers which grow on a vine above ground; therefore, you would want to add the carrots or beets a few minutes before the peppers. Another rule of thumb is that greens need very little cooking time and can often be added after the cooking process is completed. The residual heat and steam can often soften them sufficiently. Cook 1 cup of quinoa (see above). 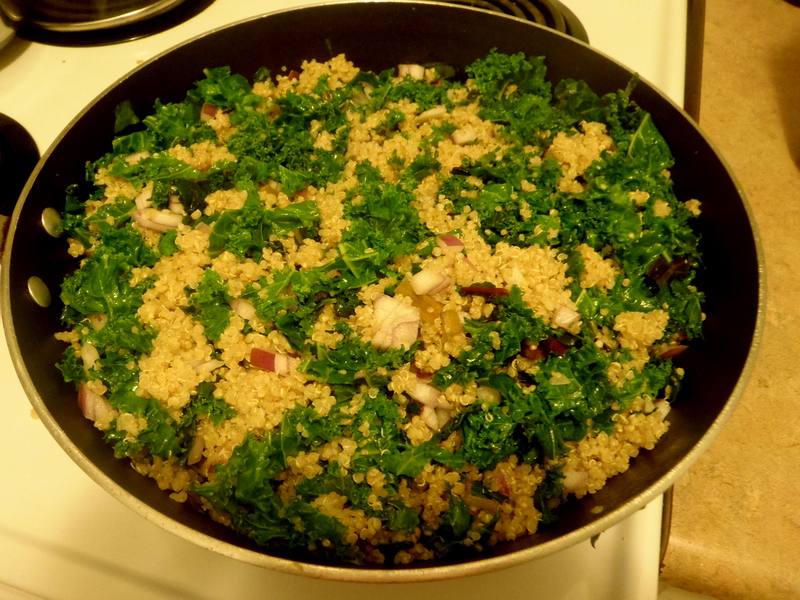 While quinoa is cooking, chop kale and chard into bite-sized pieces. Place them in separate bowls as you’ll be adding the chard after the kale. Tip: If you want to remove the kale from the stalk, grasp the bottom of the stalk and run your hand upwards. Most of the leaves should come off easily. Also, chard stalks are absolutely crunchy and delicious, so do NOT throw them away. I just add them to the stir-fry. Dice onion and chop garlic, set aside. Tip: Invest in a microplane zester (it’s like a handheld, superfine grater). It makes chopping/using garlic a breeze and is way easier to clean than a garlic press. Heat a large frying pan on low and add oil of choice. Add kale and onions. Cover and let the veggies steam for a couple of minutes, until the kale is bright green and beautiful. Once it starts to lose its luster, you may have overcooked it. Add quinoa, chard, and garlic. Mix thoroughly with a heat resistant spatula for about 2-3 minutes. Remove from heat. 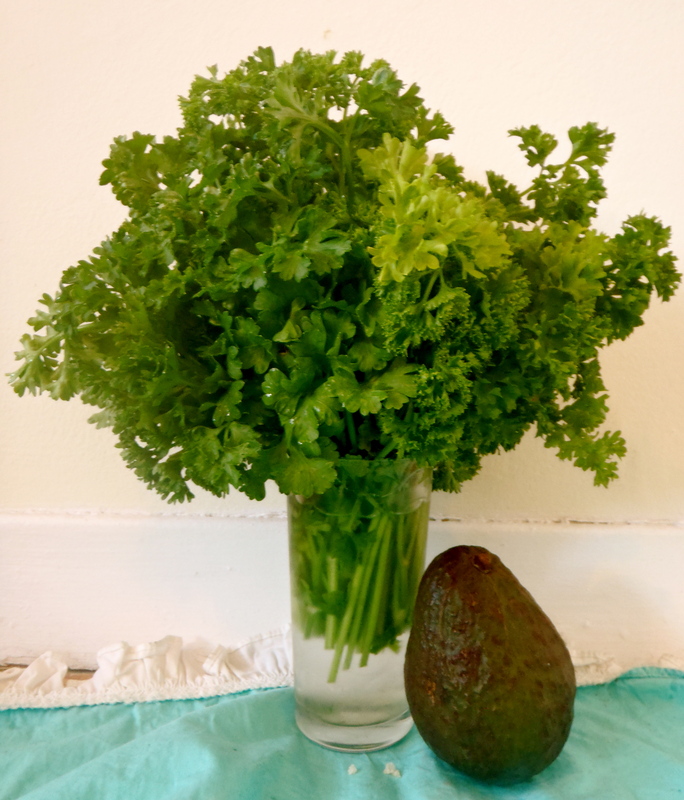 Chop parsley and avocado, sprinkle over top, and serve with dressing of choice. Our delicious meal toppers. I like to store my herbs such as parsley, basil, etc. in the fridge in a glass with water. I then cover them in one of the plastic produce bags from the grocery store. They last much longer and stay much fresher! Can be served with your protein of choice. I find it goes really well with light meats such as chicken or fish, but let your taste buds be your guide. 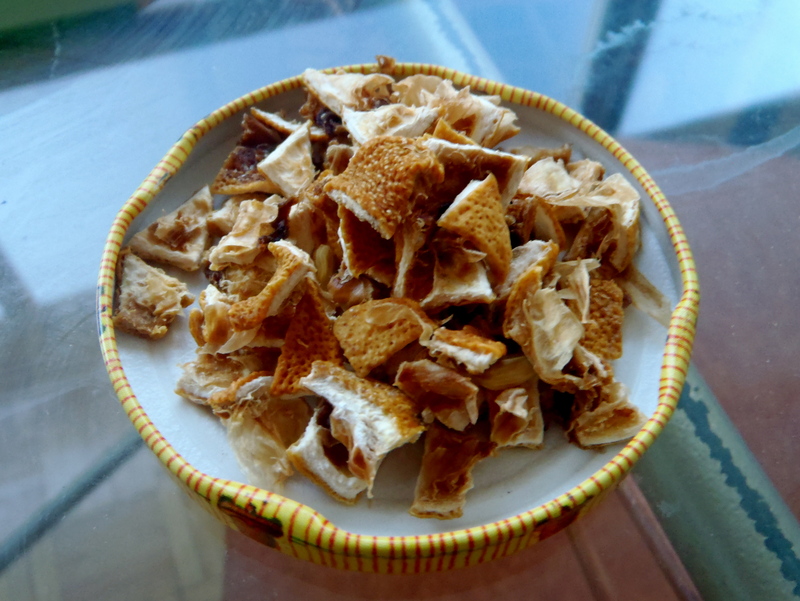 Chop some nuts or seeds to add a nice crunchy texture. I love cashews or pumpkin seeds. This dish is delicious cold and the above recipe makes quite a large portion. You can divide it up and send/take it for lunches during the week. Blend together with a whisk. Serve. Can be stored in a mason jar for several days in the fridge. 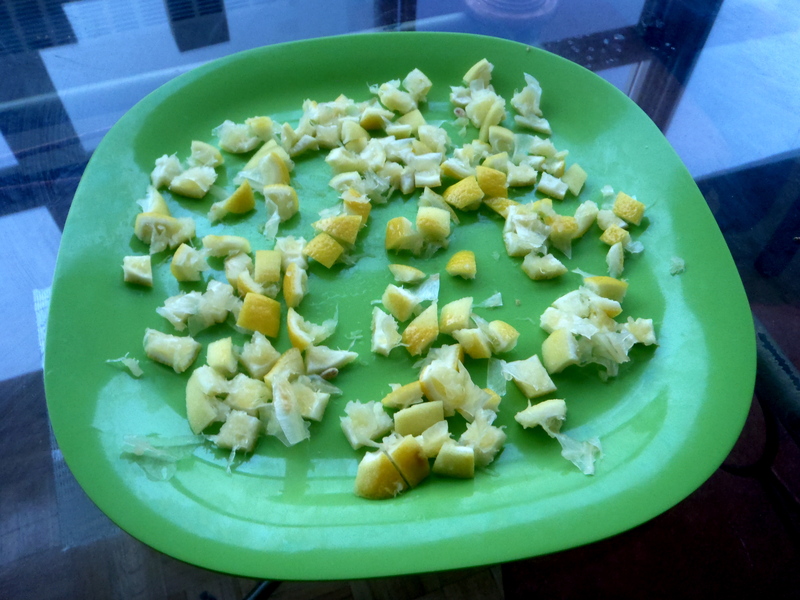 Protip: If your budget allows you to buy organic lemons you can cut them up into cubes and dry them then add them to your teas to add a nice zip of flavour. They can be stored in a glass jar pretty much indefinitely once they’re fully dried. I don’t recommend doing this with conventional lemons as the pesticide residues will leach into your tea and we don’t want to consume any excess and unnecessary toxins. Lemon rinds before they’re dried out. I set mine out in the sun to dry them even quicker. Kale: This hearty leafy green is actually part of the brassica family, a few members of which we’ve already looked at such as broccoli, cauliflower, and Brussels sprouts. Brassicas are a great source of sulfurous phytonutrients, which help support liver detoxification. A healthy liver is essential for overall health and wellness, so we want to support it as much as possible. Chards: This variety of leafy green contains phytonutrients and carotenoids that provide an antioxidant punch of protection during cold and flu season. It also contains good levels of vitamins and minerals such as: magnesium, potassium, iron, and vitamins E, K, and C. They’re also delicious and the stalks can come in a rainbow of beautiful colours, each of which will provide a different source of phytonutrients. Typically, different colours correspond to different phytonutrients, which is why nutritionists are always telling you to eat a rainbow. Garlic: This delicious bulb also contains sulfur compounds and has antibacterial and antiviral effects, which can help protect you from colds and flus. Parsley: This herb is a great source of phytonutrients (such as beta-carotene) and vitamin C, which help protect the body from oxidative stress and damage and help boost the immune system. Parsley also acts as a great chelator of heavy metals and other toxins, which it then helps remove from the body via urine. Our finished product. They can be stored in glass jars pretty much indefinitely. Lemons: These tart citrus fruits are famous for their vitamin C content (sidenote: red peppers are one of the highest food sources of vitamin C). Lemons also contain phytonutrients, which together with the vitamin C have an antioxidant effect in the body. I like having a squeeze of lemon in my water as it can help promote better digestion thanks to the citric acid and keep things moving along during the day. They are also just plain delicious in sauces and dressings. Well there we are folks. This is the meal that has been giving me my quinoa fix for the last few days. Don’t forget, my recipes are only starting places. Get adventurous and play around with flavours and foods you enjoy until it’s perfect for you. Have a whimsical day and happy eating! Love the lemon tip! I’m always looking for better ways to save me lemons as they are pretty much the once essential in my daily diet! I can’t live without the smell or the taste in my life. Thanks, Cait! Always love your suggestions! Ha, I was a bit Irish about “me lemons” there!